We might be wounded, but we refused to give up. We will hobble, crawl and eventually stand strong! WHY? Because we have FAITH that many would chunk in a heart beat. But we know our FAITH is what keeps us going. All have a story, and stories are important tell. It encourages, it validates, it brings us together as a community. We do NOT encourage the victim attitude, we encourage the EMPATHY attitude. Soon, check our my traveling site…announcement will come! Traveling Dis-Abled! Being in Pain Means You Are Crazy ! By using a pain pump, eventually, the idea is to get off of all oral narcotics and other pain relievers. This is done GRADUALLY! As the medications are tapered down, the morphine in the pump is increased until the goal is met. Many needing high dosages of controlled substances like this idea as little gets into the system. The morphine drips into the spinal fluid, getting to the nerve pathways. Very little is needed in contrast to medications taken by mouth. Each month, the pump is filled (painless for me). If an increase is needed, then it’s done at that time. A bolus can be given about 5 times per 24 hours, via a wireless small box the patient places over the pump and presses a button. This pump gives many a much better life! Be EDUCATED and have a doctor who is knowledgeable about pumps. My views and experiences are mine and may or may not be the views of other users. Experiences differ, and my experience is rare. In my journey of twelve years of severe pain and TBI (traumatic brain injury/concussion) that may never resolve, I’ve come across physicians who have never questioned if I’m “wrong”. Surely I am the expert of my body, and would know if I’m in pain! Most of these doctors also included my husband in all visits, which is smart on two accounts. One, the divorce rate for couples is up to 75%, and engaging the spouse, keeps communication open. Smart! Number two, is the one in pain is often not aware of their actions, or sleep habits, and what medications help more than others, and many other aspects of their life. Including the spouse, or another who knows the patient well, has not only helped doctors make better diagnoses, but it actually gives the patient more freedom from pain. Or at least a shot at it! My husband was a major player in all doctors visits. They talked to me, and then they asked things I wouldn’t know about…. how does she sleep? Does she toss and turn? Do the tremors become worse at night? What do you notice when the pain becomes worse? What medications do you think works best? And eventually, “what do you think we need to do with the meds to help her get relief”? Did I get upset because some questions were not directed to me? Absolutely NOT! I found it hard to communicate and came with lists I had kept between each appointment. I tried to be organized, but some things, I wasn’t able to remember or process. I NEVER felt I was commiting some sin, because of being the unlucky person who was on the freeway at the wrong time. And it was a great help in our relationship as husband and wife to be treated as a team, and work as a team. Sure, we kissed a lot of “frogs”, but found a few Prince’s of physicians! Fast forward to the 12th year of pain. Unbelievable pain. Pain that kept me from enjoying time with family, and grandchildren. We’ll skip the emotional pain of attitudes from friends and family that weren’t supportive, and turned away in our deepest need. We all know it comes with the territory, not making any excuses, of course. Being on high dosages of Morphine, and other pain meds, my weight went sky high, and so did the pain! By the end of 2012, I was no longer a functioning member of our family. Isolated, rarely seeing faces, and my husband was not a team member anymore. Why should he come to all the visits – I could get there easily, and he didn’t seem to be important. In fact, I’m not sure why I went to the visits since it seemed I took up time that was already strapped, and the attitude of “GUILTY until proven INNOCENT” was the attitude. I brought pictures of my family; my darling grandchildren. They were ‘oouuu and awww-ed” over, and an interest was taken over each one. After a quick rundown, I made my point…. THIS was MY family, and yet, I was not involved. I missed so many opportunities, and no longer was willing for this lifestyle. 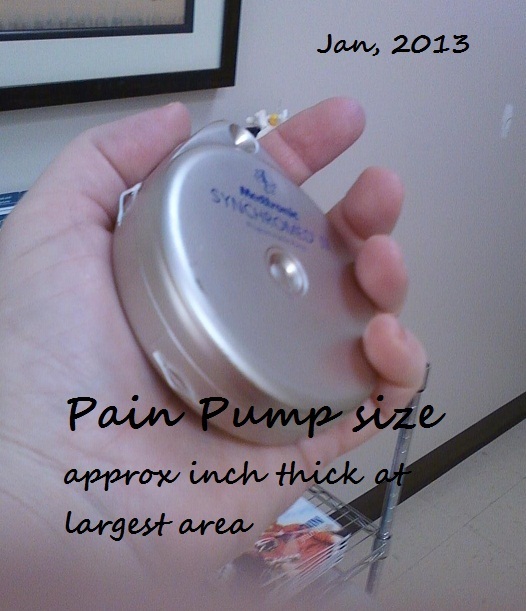 A pain pump had been researched and discussed with others, and I felt it was time. Surprisingly, so did the Pain Specialist. That was probably the last good judgment call that was made for a long time. First, I was to be weaned from all Morphine. What? Did he not understand PAIN? He quoted some scripture, which was nice, and something about prayer. Okay…. so if I had enough faith and enough “pull” from above, I could do this. I DO believe that those in pain, MUST rely on a higher power, or we would find it hard to make it this far. I read his bio again and researched him, and it appears he changed from his previous specialty to Pain Management, as he had his own personal pain, and prayer was his cure. Oh, why didn’t I think about this before choosing him? I doubt I have to tell much more of my story, er, nightmare! He was firm…. morphine has to be very low or stopped before the trial. My husband knew this was NOT going to work, so he was very careful in monitoring things. I lived in pain, rarely leaving the house in December. So much for the holidays! I lied. I wanted to have at least 10% of life. I wasn’t off of Morphine, because I knew it was impossible, and this doctor has no clue about the reality of pain. (more to this story!) In fact, I was shocked at his naivety of a pain patients life. Except… no pain relief. My husband was not going to watch me roll around on the living room floor (literally), so he began giving me small dosages of morphine, along with the other medications. It didn’t help. I went from a .5 to a 5 in pump dosages in about 10 weeks. Emails were written almost weekly begging for help. I was no longer cognitive, and couldn’t think to even try to explain what was happening. I could answer “NO” when asked, “have you ever gotten relief”. He kept raising the dosage, but no relief. Let’s pause here and consider. The booklet that is sent home, (which would also be something the physician would be knowledgeable about), said if the patient is not getting relief, check to see if the catheter is in place. NEVER was that an option, but requesting firmly to see a psychologist was! And just who needed to see a psychologist? Time went on, and a mat was made in our living room, and there I lived, with a bath once a week. Curled up in a ball, a helpless husband doing everything he could think of, yet no response. One day it hit me “I have to die! I can not keep doing this.” I didn’t want to tell my husband, but all I could do is cry and say I didn’t know what was wrong. I feared to stay alone, even though I was afraid to do anything, the feeling was strong. Saying goodbye each morning to my husband was a fearful thing. Many knew of our dilemma, yet we all know the common responses. Truly alone, I approached my husband, as he had gone into his cave – the only way he knew how to deal with this horrific situation. Calling him out of his cave, got action beginning. Someday that will be his story to write. I’m sure it’s a sad one. Where I lived on the floor for 3 months! On Saturday, March 17, I didn’t know if I was having a TIA, but something was happening in my brain. Not able to think correctly wasn’t helping! I was scared. I felt I would die. I had been in so much pain, I had forgotten to pray. I couldn’t read my bible. I could call out and ask for help, but did I really have a relationship? As we all know, churches aren’t the best resource for those in pain. No longer was there effective communication in my extended family. My son would call, and listen or read my emails of not coping and write beautiful emails back. He was empathic and always there if I needed someone. Three dear friends did what they could, but lived miles away. They came as much as time permitted. My husband was home as much as he could be, making sure food was fixed, and ready to grab. I was no longer a human, just a body in exisitance. Tears were constantly running down my face – it seemed they would never stop. My husband wrote a poignant email to my pain doctor, begging for help. His reply? Out of town, hang on as best you can and will see you on Monday. Period. May I ask…. would this have been his response is this was HIS mother, loved one, sister? I know the answer… NO, it would not be acceptable. But it was acceptable for another. This was more than I could take in, and the look on my husband’s face – the letdown – is something I’ll never forget. When answering the phone, the smile went on, and the mask became me. How could I explain I needed help? No one really wanted to know. Those who did, got the real story. Those who were in bad health grieved with me. Mainly, I was just someone with a “a headache”, it seemed. We were having a grandchild’s birthday in our club room, and It took all I had to go for a bit. Scared, alone, intuition strongly said I was dying. Sepsis came to mind – who knows why, but that would be a death sentence. Funeral plans were made on a scrap of paper. I wanted my family. I wanted their rational help. Words wouldn’t come. We were drowning. We asked for a family meeting but was misunderstood. I could hardly look my husband in the eye, as he finished cleaning up. Crushed. After 3 months of no relief, seizures, TIA’s, at least one stroke, unable to drive 1/2 mile to the doctor, a new PA came on board. He was concerned. The second week I came, (the day after my husband wrote his poignant email, and when I knew I was dying) he wasn’t going to let it pass. (I credit him with saving my life). I was past communicating, although I knew our internist was very concerned and had done as much testing as she had available to her. She was concerned about the lack of care coming from my pain specialist. The Pain Specialist practice was headed up by two well-renowned physicians, and one was called in to do a dye test to see if the catheter was in place. (only 3 months late in asking, instead of 3 weeks!!). I had become so hypersensitive to touch, that I couldn’t be touched! I could only handle tight (swaddling) clothing. Showers were pins and needles. I couldn’t use the CPAP, as the air going into my nose was too “annoying” and almost painful. Air could NOT touch me anywhere. I couldn’t think one cognitive thought. I was lost in the milky way of space. I held my head and said over and over “I’m not crazy, I’m not crazy”. I wanted to announce to the world. I wanted it on the headlines! I WAS NOT CRAZY! My own pain doctor had little to say. The other physician, who did the dye test, was merciful on surgery day. Not being able to be touch, I was “out” before moving me from the gurney. He was the only one who was kind, that- I do remember that day. The Medtronic booklet says a side effect can be something like an inflammatory mass (which I accepted the side effects, but I did NOT expect to be ignored when things begin happening), he scrapped out a type of inflammatory tissue, necrotic (dead) as if I was rejecting the pump. No one has to tell me what could have happened if it went on. I was right… I would have been dead the weekend after St. Patrick’s day if not for a persistent PA. The color already becoming brown, sepsis beginning. Death, unless one is fortunate, is 24 or so hours later. We went through this with a dear friend, who didn’t make it. My temp was 99. I don’t bother to explain anymore because I am not believed. When I run a temp of 99, that is a sign of a higher temp. The meds have caused me to be unable to run a temp over 99, and normally anything under 100 is of no concern. We asked for pictures and my husband was amazed. The Doctor said they completely re-did the surgery, putting the pump in an antibiotic solution, then putting it in a sleeve to protect the tissue against the metal. WHAT? Every video I have seen showed the pump in a sleeve for protection. I consider this MISTAKE NUMBER ONE. (In my books). The catheters were unsuitable and were replaced. But reality? The one in charge of my care was the one I trusted to listen, to be pro-active, and to treat this with the care it deserved. How can ANYONE miss something so vital as a patient who was dying a slow death? I wish I could say this was the end of the story. Because “something wasn’t right”, and I only knew it as “deja vu”, my neck muscles were rigid. My teeth felt huge, and I was completely disconnected to my body. It wasn’t a TIA, but WHAT was it? I knew if I mentioned too much, I would definitely be considered crazy. That night something happened that I felt was serious. I felt I needed to go to the ER, yet I was to ill. My little dog, my personal caregiver who never left my side, put her head over my chest/stomach area and held still. Intensely she was still. Not moving or hardly breathing. Then she sniffed the air quickly and her assessment was done! 🙂 She got in my face and looked fearfully at me. I was as scared as she. She never left my side. Finally, because of coincidences, (? ), I looked up seizures. I had them before and I am on anti-seizure medication. BINGO! Deja vu! 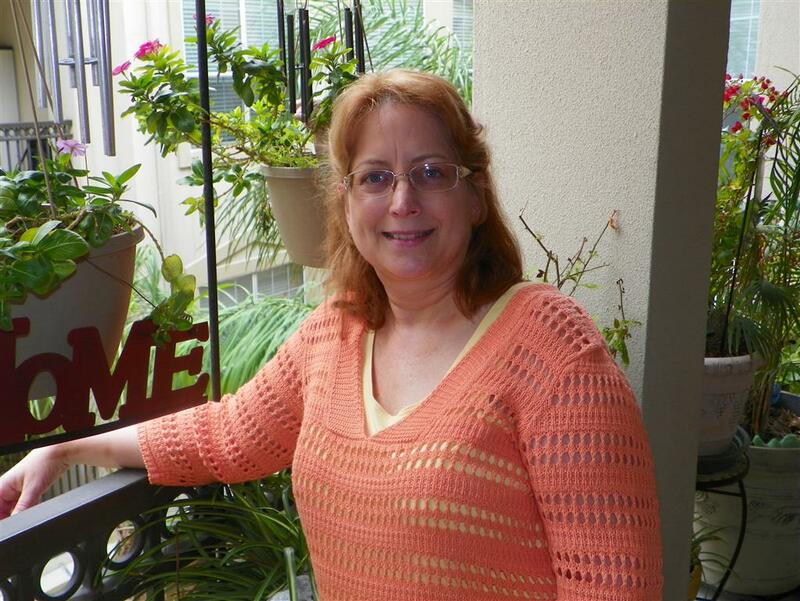 I was having small seizures that couldn’t be seen by my husband but could be felt by me. There were blocks of time I couldn’t account for but had decided it was from the pain. This feeling had been going on for almost a month. Later, I was watching a video I had done and to my surprise…. (and horror) I had seizures! It was noticeable, but I wasn’t aware of them! Immediately I made an appointment with my Neuro who helped with many of my other issues, including seizures. I was put in a room with a bed… I was reduced to this. In a mesh bag, that only my little dog could see out, and one couldn’t see her unless they really looked, she quietly sat and watched. She refused to stay at home and howled until I returned. Scratching off paint, trying to get to me. I couldn’t leave her anymore. She is quiet, but she has to be nearby. I had to respect her. I doubt anyone knew, except when I went to the restroom, I quietly said to the bag, “I’m okay, I’m going to potty”. She was quiet, but I wonder what the nurse thought? Maybe she looked closer. Just for your information, Hell hath no fury than a Russian (I think) PA who has began to understand the trauma imposed by someone who called himself a doctor. (her insinuation, but I can’t remember her exact wording). The more she discovered, her anger grew. The doctor she worked with was on his way out of the country, but she called him. I don’t think I would want to know his reaction to her findings. In their bed, in another area of the office that is used at night for sleep tests, I lay unable to do much. It was too much to take in. To realize this wasn’t my fault. It had nothing to do with my spiritual life, not my psychological thought process, BUT BECAUSE I had a Pain Specialist who had no business being in the business of helping those in pain. He lacked listening skills. He lacked intuition. He lacked good judgment. And he lacked basic knowledge. I would almost guarantee, he would fail any test in regards to the pain pump. He would have failed because he had no idea what was in the booklet given to all pain patients. His attitude kept me from bringing up the obvious. Something was wrong with ME. As I began to get better, I began to realize what had occurred during the past 4 months. All I could do was cry. The hopeless feeling was huge, and where was I to go and get the help I needed. As it has been said many times before, people in pain may not have real severe emotional issues because they have worked through them. But, because of not being believed, mental and emotional issues arise that otherwise would have never presented itself. So there… now my doctor is correct. Maybe I do need a psych! My drawings became angry, my journals became angry. Not at him, but for what he caused. For what he brought up in our family, the things I really didn’t want to know was there. For the things that were shown of “friends”, and their life and happiness caused them to be too busy to give an hour to a struggling family. I didn’t want to know these things – even though I already did. My anger hadn’t got around to him. It will, and it is beginning. It will start with a long letter and education. I’ll take another route. I’ll take the highway. Not one of ignoring him (as he tried to do to me), but of educating him. Of getting rid of the “everyone’s happy” feeling he thinks pain patients life is about because we don’t tell everything. Because of doctors like him. I’m asked a lot about doctors. Because of where I worked, and experience, and my experience with pain. He is added to the small list of ones to stay away from. The few I talk to his patients were interesting. Women weren’t doing too well. Men were doing great. Never dismiss what research says. How did I get through all of this? I’m not completely sure yet. I know God was with me because no one else was. Desperately needing to know, I asked for a sign, and it was granted. I did have some friends who went the extra 20-30 miles to come help. I was fortunate to have a PA who “got it”. Those on Linked In, were sure I wasn’t “mindful”. Their judgment became too much. And they don’t even know me. I was given good resources from others (healthcare givers) and found the alternative help I hope to use. Ultimately, (as some requested) I had to listen to my body. To realize I KNEW what was happening. To stop and let my body tell me what was going on. To keep the outside voices out. To watch my little dog, who knew more than those with an education. Then, to think about my team, and who would help me. The pieces came together, and the “mystery” solved. The anger directed by the PA at the office of the Neuro, at such a horrible lack of care, was very validating. Especially, when a flash of anger in her eyes, and my thoughts were verbalized “you could have died”. I thought it was a crazy thought. A dramatic thought. In reality, my body knew it was a realistic thought. I often wonder if I had been with another physician who asked “what do you think is wrong”, would I have known the answer? I think so. Because I had read the booklet. But I had bought into “something was wrong with me, my psyche”. When teaching at a well-known hospital before the accident forced retirement, that was something we taught to nurses and to patients. LISTEN TO THE EXPERT! Who is the expert? The expert is the one it is happening too! The PhD or MD is basically worthless unless the true expert has a say. If the little things were heard, and thought about, and more probing was done, and maybe even asking the 2nd expert, my husband, proper treatment would have been started, with proper medication, and a happy ending might have been the ending after one month of the original surgery. Especially if a “minor” thing, such as a sleeve, had been put on the pump! All the little “minors”, become “majors”. But, life goes on in their world. Unless it was someone they loved. “Resiliency research has shown that being able to provide meaning to adversity is an essential part of being able to bounce back. This usually involves finding a positive aspect, some silver lining to a crisis. Maybe a new opportunity arises in one area of your life when a bad thing happens in another. Or maybe the crisis begins to make sense later when you get a bigger picture of the time frame in which it occurred. (I am creating a blog post with part of this again. RESILIENCY. Using studies, research and general information, I understand TRAUMA and am not ashamed of how it has affected me. With that knowledge, it gave me the power to do my part in healing and allow God to handle the rest. If we don’t understand the body and its cause and effect, then we will blame ourselves (and accept blame when it is not appropriate). It’s going to be hard to find a silver lining here. How do we make any sense at all of a senseless act? Maybe we don’t right now. It’s part of our human tendency to chew on things for a bit before we figure them out. Showered, Dressed! A days accomplishment. My feelings exactly. Time. Time to think. Time to grieve. Time to heal, not only our hearts, but those who were with us. Then, time to let go. There is nothing “crazy” about this. And Rosie was promoted with a formal note from a doctor! A Service Dog! I will write about her later. PS. By the end of 2018, I will be able to complete this story. 18 months ago, a doctor said to me “your statue of limitations are up”. Expressing the trauma and how I could not talk, she simply said: “write it down and send it to the AMA/Texas Medical Board”. One thing I will say, THEY ARE YOUR FRIEND unless you are harping on something that is beyond anyone’s control. If you have experienced a mistake (the 3rd leading cause of death in the USA, but un-reporting could make it the 1st) cannot be tolerated. I have been taken care of…mentally and spiritually. They have been very kind, gentle and leading with a soft hand. They understand. I’m not a “number”, I’m Cathy. We do have a place who will listen if something has been done that is a terrible crime against us. I have great respect for those who oversee physicians, and how they handle mistakes that are completely preventable. Thank you for your continued support.